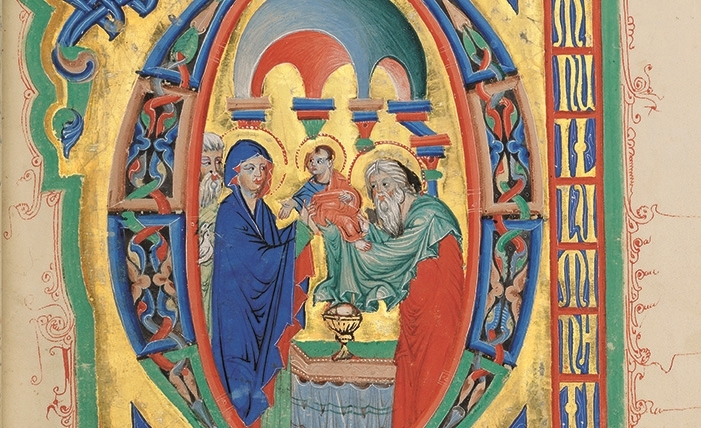 The imposing and exceptionally sumptuous illumination of the Breslau Psalter delights the viewer. Sparkling gold burnished to a high shine, brilliant colours, and an impressive variety of motifs are displayed on every page. The manuscript stands out for its precious book illumination and the obvious relish for pictorial narrative of the artists involved. Discover an entirely fresh, varied and exhilarating medieval imagery melding various influences and traditions of European book illumination into a harmonious whole. A unique pictorial program illustrates the 150 Psalms from the Old Testament and the Canticles (‘songs’), leaving much scope for playful creativity. Throughout the volume the borders framing the pages are populated with small hybrids and magical creatures, beasts, birds, hunters, musicians and acrobats. Marvel at the wondrous wealth of this magnificent psalter! 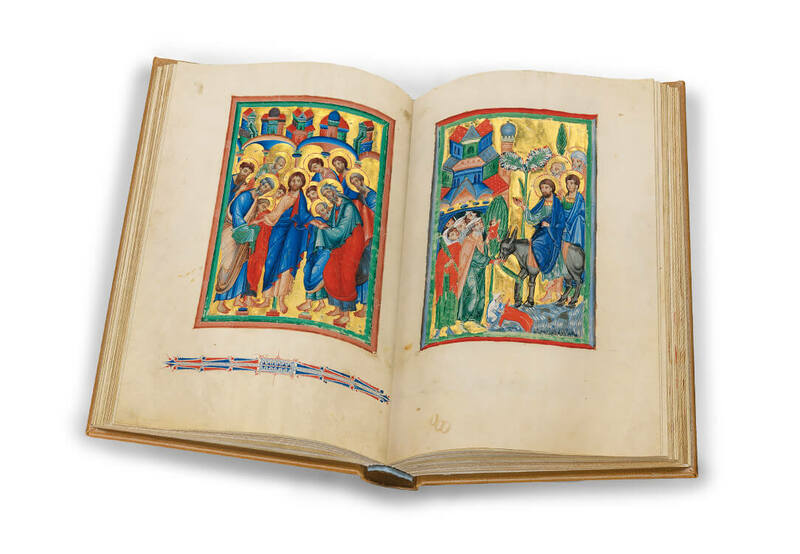 Produced at the ducal court of Silesia around 1265, the Breslau Psalter exemplifies the movement of medieval artists and the cultural exchange between East and West, North and South. The text was written by German scribes. An Italian book illuminator from Padua, the Master of Giovanni da Gaibana, has been identified as the main painter who gave this splendidly shimmering psalter its characteristic Italo-Byzantine appearance. 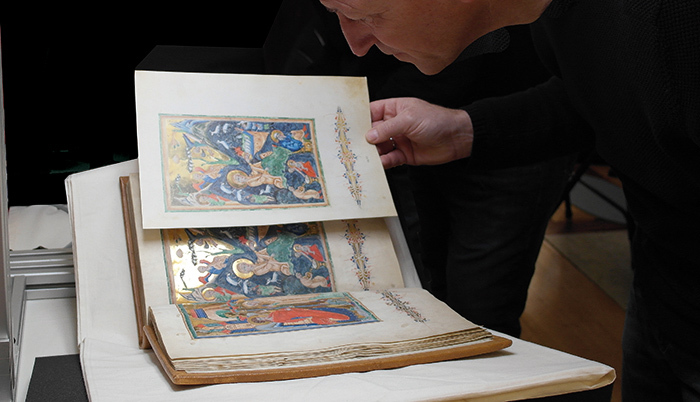 An entire team of local Silesian book illuminators completed the manuscript, following the master’s design. He created an imagery combining sparkling gold grounds and Oriental cupolas with an Occidental repertoire of visual forms. It includes interlace ornaments inspired by insular art as well as fleuronné pen work from French book illumination. 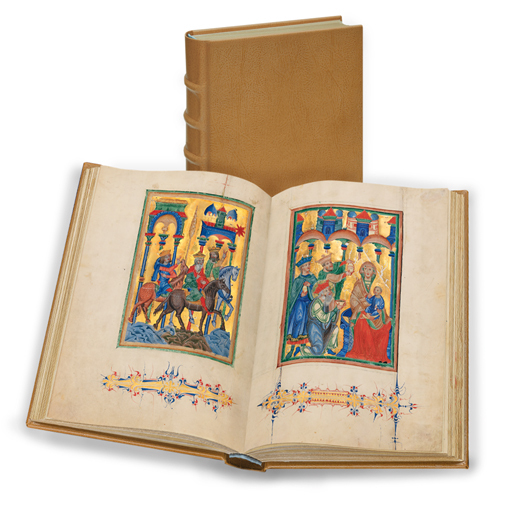 In the Breslau Psalter, each of the 150 Psalms from the Old Testament, as well as all the Canticles, are illustrated. The text pages are embellished by a total of 168 small miniatures on a gold ground in the margins, sometimes up to three on a page. While being inspired by the content of the various Psalms, the favourite subject of the miniatures is King David who in the Middle Ages was considered to be the author of the Psalms. The pictorial program of the manuscript, which is without precedent, might have been designed by a highly educated theologian, possibly the Court Chaplain in Breslau. Obviously he carefully considered in each case which verse would be best suited to illustrate the message of that particular Psalm. The book illuminators then followed his instructions with brilliant artistry. On certain occasions during the Middle Ages, the Silesian dukes would display the Breslau Psalter to their guests at court, to impress them with its splendour and the wealth of its miniatures and gold. The lavish illumination, the emphasis on Bohemian saints in the calendar, and the female wording of the prayers suggest Anna of Bohemia (1204-1265) as the courtly patron. She was the widow of Henry II, Duke of Silesia. Her son Henry III, together with his younger brother Wladislaw, governed the Duchy of Silesia-Breslau from 1248. Wladislaw studied at the University of Padua. He probably brought the Italian Gaibana Master with him when he returned to become Archbishop of Salzburg in 1265. The book illuminators of the Breslau Psalter place the figures in the miniatures and in the imaginative architectural borders on a gold background symbolising the divine sphere. 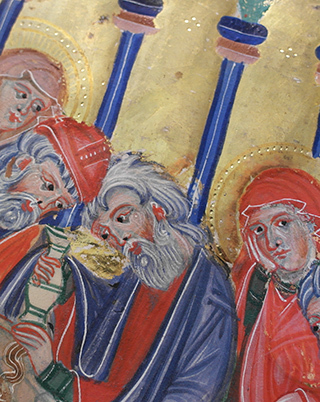 In contrast to the distant attitude often seen in Byzantine-influenced book illumination, some figures are highly individualized showing smoothly modelled facial features which are almost portrait-like in appearance. In fact, their facial expressions and their postures clearly reflect discernible emotions. In miniatures where the artists needed to render mourning or dismay, they emphasised empathy and compassion, thereby expressing certain profound aspects of human nature with a heightened emotionality. On fol. 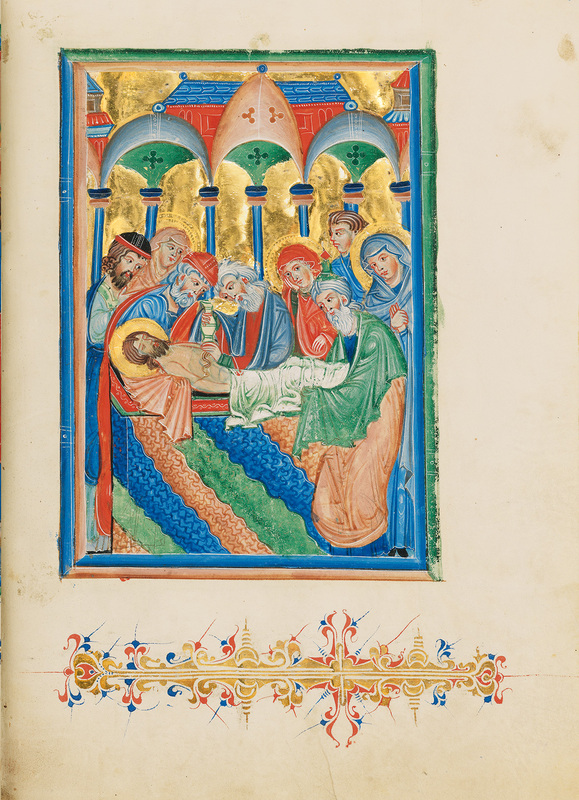 99r, the book illuminator represented the touching scene of Christ’s Deposition. After having been anointed, his body is very carefully laid into a marble sarcophagus. Standing about the sarcophagus are men and women, young and old, with gentle and carefully modelled faces. Their facial features and gestures express mourning and compassion. Traditionally, a hand put to the face is a gesture of mourning, as is the gesture of wringing one’s hands as a sign of sadness. Two groups with different lines of sight are depicted. Apparently lost in sorrowful thoughts, the women are gazing into space outside the picture. The men, holding the body with veiled hands and anointing it, are completely focused on the body of the Lord. 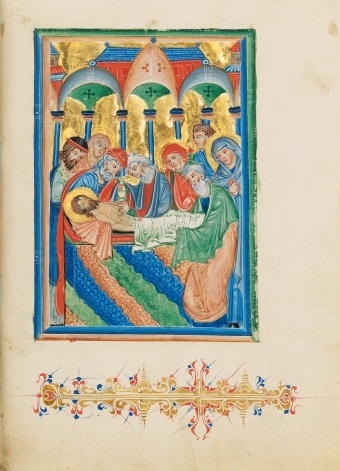 Whether looking at the original or at the facsimile of the Breslau Psalter, the viewer is fascinated by the exceptionally luxurious illumination of this masterpiece of European book art. It is among the most sumptuous Psalters of book illumination. Gold and brilliant colours are displayed on every page! The sequence from the Breslau Psalter reproduced here comprises fols. 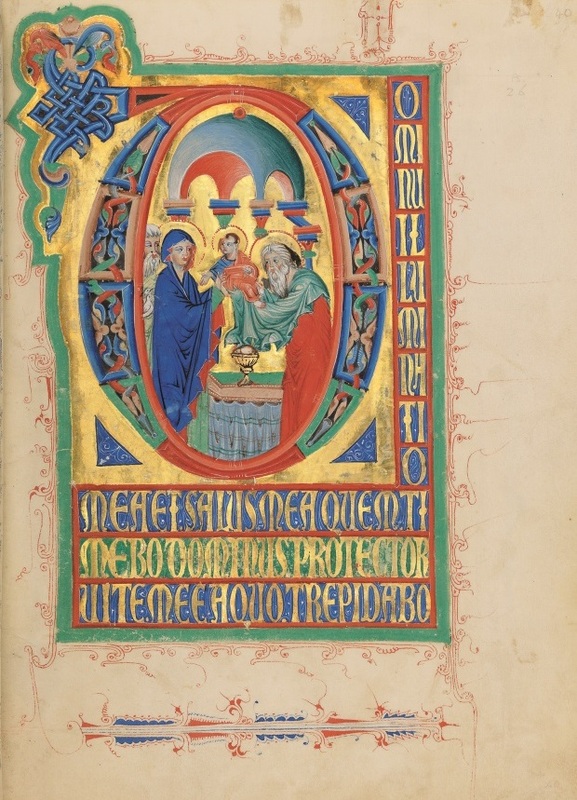 100v-105r, which exemplify the lavish illumination of the manuscript. It opens with a full-page miniature for Easter Sunday, showing the Three Marys at Christ’s Empty Tomb. The splendid C-initial with the school of singers (‘schola cantorum’) on fol. 101r illustrates the theme of Psalm 97, “Sing to the Lord a new canticle.” The following three Psalms are decorated with miniatures in the margins. Fol. 103v depicts Christ’s Descent into Hell, while another lavishly adorned initial is shown on the facing page. The fanciful figures in the margins on fols. 104v and 105r both amaze and amuse the viewer. 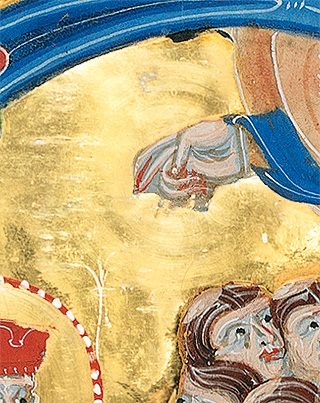 The Breslau Psalter contains an unusual decorative element. In some miniatures and historiated initials the book illuminators embellished the gold background with tooling and incised lines forming delicate circles and semi-circles. The circles with surfaces burnished to a high shine are perfect, in some cases even showing the puncture of the compass needle point. The technique the book illuminators used on the burnished gold areas has not yet been fully understood. The specialists working on the facsimile faced the challenge of developing a method to render these circular areas faithfully. It took them numerous trial runs to achieve the same brilliant effect as is seen in the original. Every page of the Breslau Psalter is graced by miniatures set against a gold background or by numerous gilded initials. In addition, the 168 miniatures in the margins exhibit delicate gold-on-gold brushwork and punch-dotted patterns in the gold areas. For the facsimile production, these features involve additional time-consuming steps, especially for the lithographer making the print runs as he reproduces the gold. This likewise applies to comparing the prints with the photographs of the original and matching the prints with the original manuscript in the museum. 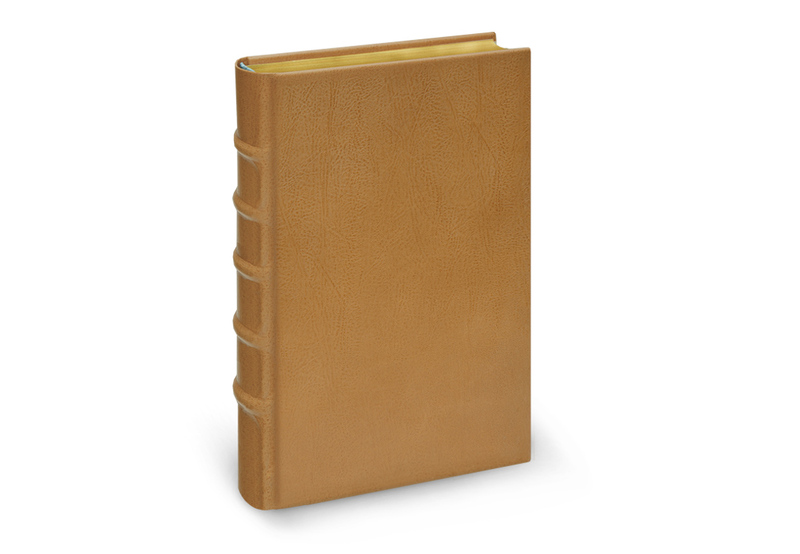 In separate print runs, both the gold and the tooled patterns are applied to the special paper reworked by hand. When the reader of the facsimile turns the pages, the light reflected by the gold design breathes life into the illumination. Looking at the facsimile folder of the Breslau Psalter you get a first impression of the manuscript’s sumptuous illumination. It contains three original facsimile leaves exemplifying the wide range of imagery employed in the Breslau Psalter. A page indicating the feast days for the month on fol. 12 shows the lavish illumination of the calendar. The miniature of the Entry into Jerusalem represented on fol. 50r demonstrates the profuse ornamentation and the expressiveness of the full-page miniatures. The sample page with two miniatures in the margins on fol. 55 provides evidence of how much sparkling gold is applied even to the initials and borders of the text pages. 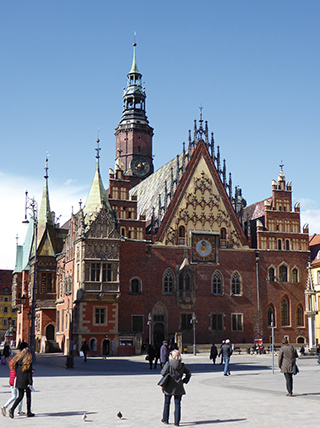 In a richly illustrated brochure comprising 16 pages, learn more about the history of this magnificent manuscript executed in Breslau. Discover further details of how this work blends various traditions of book illumination from all over Europe. 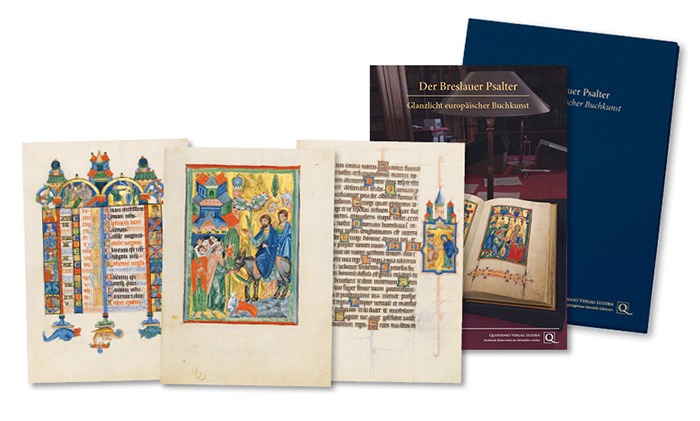 Click here to go to the online shop (only available in German) where you can order the facsimile folder for the Breslau Psalter edition. Or send us an email to info@quaternio.ch. We would be glad to provide you with additional information regarding the fine art facsimile edition of the Breslau Psalter. Click here to order the brochure.